I was born and raised in Addis Ababa, a city located 2300m above sea level, where the sun shines pleasantly and feeds you with warmth, even on chilly days. During my childhood I smelled the aromas and tastes of our traditional food as it was prepared with delicious spices, fresh ingredients and of course Teff - one of the world's oldest grains. Before we milled the Teff’s tiny grains, which provide us with so much of what we need for our daily diet, we would expose it to the sun. It was always a beautiful sight to behold. A part of daily life as a child that I remember vividly. I would admire it with wonder, while at the same time vigilantly keeping an eye out for opportunistic chickens, birds and cows. Whenever I return home I am reminded of how virtually all the ingredients in Ethiopian cuisine are still widely prepared in the home. Without any effort at all, time spent back in a typical Ethiopian home translates into time where processed food is automatically removed from your diet. Here at Addis in Cape we strive to maintain that powerful tradition to the best of our abilities. Every ingredient and our spices, which come from Ethiopia are exposed to the nurturing warmth of the sun. After traveling and living throughout Asia, Europe and the rest of Africa for some years, I decided to share the cuisine that I know best. In 1998 I opened Addis in Dar in Tanzania. Encouraged by its continuing success, yet drawn to South Africa by its people and its energy, I opened Addis in Cape in 2007. 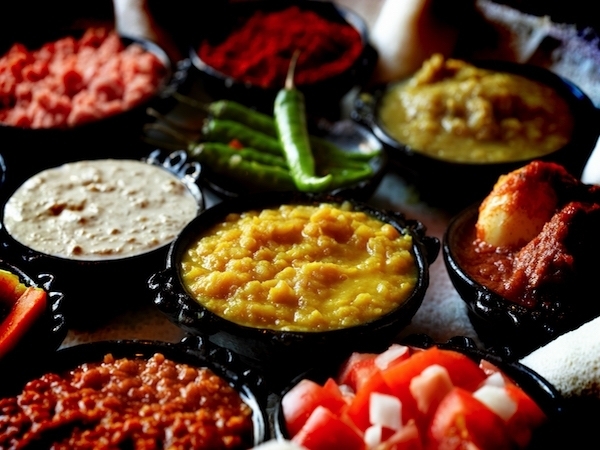 Ethiopian cuisine is famous for rich aromas and the generous use of herbs and spices. Some of you might think that the food we serve at Addis in Cape is not as spicy as you expected it, yet we are serving you the taste I grew up with and which I was taught to appreciate by my father and my family. The spices at Addis in Cape are imported from my hometown of Addis Ababa or to be more specific, from my mother! She is very strict in the way she applies the traditional method: she prepares the spices with care and a peaceful energy, while blessing them with love. Here in Cape Town we do everything as a team. Our Ethiopian chef and the South African sous-chefs work hand in hand to share the care and love needed to serve healthy tasty food to those who come to visit us. When you are at Addis in Cape, don’t forget to try some Tej, the sweet homemade Ethiopian honey wine or home-brewed Ethiopian coffee. They both add to the experience. The energy and the care which is given at Addis in Cape for the preparation of food is immense, while at the same time we use both pleasure and consciousness to achieve the right quality. That in itself is our most important recipe and secret. Addis in Cape welcomes you and invites you to share our passion for a taste of the extraordinary. 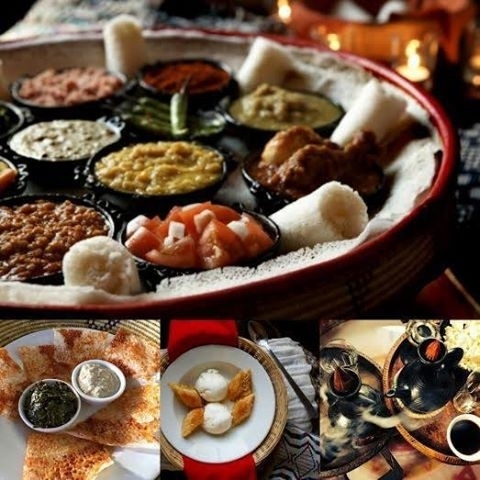 Ethiopian cuisine is traditionally served on a large, thin, pancake-like sourdough base called Injera, which is usually made from a grain called Teff that is native to Ethiopia. Teff is now also being harvested in South Africa. However, where Teff is not available, other substitutes can be used such as buckwheat, sorghum etc. At Addis in Cape we use rice flower or Teff to prepare the Injera, which we bake on a flat clay stove called a Metad. Injera which is fat and gluten-free is used to scoop up the various sauces and stews called wot. General name for all stews and sauces. Alicha is the mild alternative to all of our dishes. To prepare the food we use mild and flavourful turmeric that colours the food in beautiful golden yellow hues. A selection of imported Ethiopian ingredients and items. See cabinet on the first floor for jewellery. An important ingredient in Ethiopian cuisine, Berbere, which is prepared by milling dried chilies with several herbs and spices, such as garlic, onions, ginger, cloves and cardamom, is used in making all our spicy dishes. A clarified butter simmered in various spices such as fresh herbs, turmeric and cardamom. After the butter is flavoured with the spices, it is then strained, cooled and used in the preparation of all our Non-Vegetarian dishes. The spices in Kibe provide our dishes with a unique and beautiful aroma and intense flavour. Vegan dishes are very familiar to the Ethiopian Orthodox people who are accustomed to a minimum of 180 fasting days a year. When we fast in Ethiopia, we adopt a vegan diet and this dedication is thoroughly reflected in our delightful vegan options. 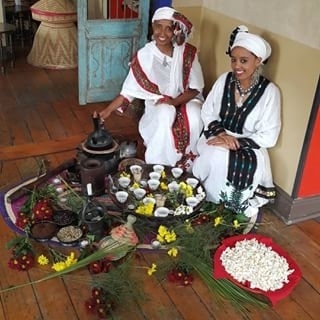 From the traditional furnishings and the classic Ethiopian coffee ceremony to the serving of food itself, we offer an exotic alternative to anything you may be used to. 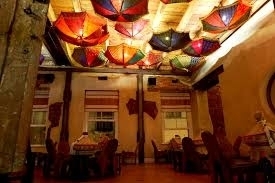 With its authentic décor and cuisine, sharing a meal at Addis in an experience.